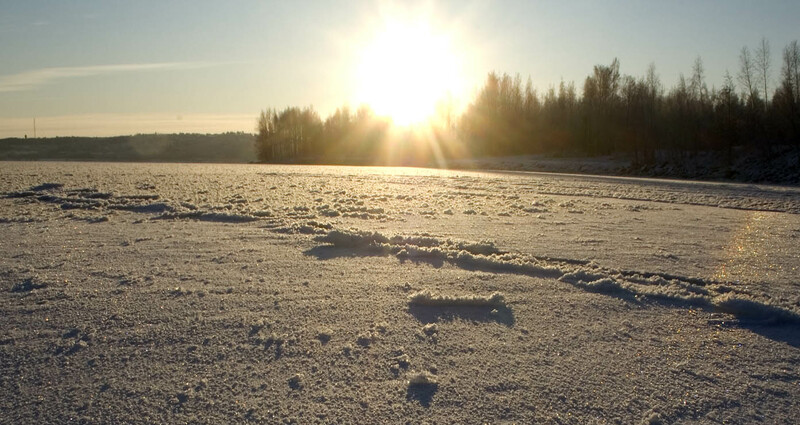 Last winter I noticed one sided 22° halo on ice surface ( 1 ). This winter there has been a couple of more cases with varying degree of one-sidedness. The displays seem to be a rule on even surfaces, either on plain ice or snow that wind has swept hard. The one above was seen today on lake Näsijärvi ice. It was visible on a patch of hardened snow. No matter where I moved, the asymmetry stuck. This is an interesting observation. We already routinely accept these azimuthal anomalies in surface halos but would it be totally beyond comprehension in atmospheric halos? You suspect there is azimuthal anomaly in the photo, or just an example of an atmospheric halo? That's dramatic. What time of day was the photo taken? And did you try to look at the crystals as they lay in place? Marko, not necessarily. These "one sided" displays have just been bugging me. I know it does not seem plausible (at all) in atmospheric halos though. I liked this case too because it showed up so clearly - no stacking needed. It was midday. I did not have crystal photography equipment and was too lazy to come back again. Part of the reason was that the patch got into shadow. Anyway, I will be looking for these through winter, so maybe I'll get those crystal photos. In this case one is tempted to think that the ice sheet is filled with pencils all pointing (c-axis) roughly at the same direction! Imagining that the c-axis is pointing, say, about 20° from the vertical and in azimuth leaning a bit towards the Sun, would allow light to take the 22° halo path only from one side. Did you examine the ice surface more closely? Well, I looked close by and there seemed to be larger structures that were azimuthally oriented. But the crystals that made the halo were too small for naked eye. My thought was that the morning sun might have rotted out the crystals on their southeast sides. But if that is the explanation, I would have guessed the photo to be a bit later, more like 2pm or later, rather than noon. Anyway, a look at the crystals ought to reveal any such one sided melting. "Intensity asymmetry was not caused by local changes in crystal densities because it was seen wherever I walked on the ice." This more or less rules out the melting. That is why the azimuthal orientation preference came first into mind. If rotting were the cause, we should see asymmetry also from displays on soft snow. But these asymmetries occur only on hard surfaces. In the spring you can see still symmetric 46 halos (maybe also 22, but is often too high) on snow surface when it is around 0 C and snow in the streets etc is melting. Anyway, I will make later another surface halo posting from snow ferns. It showed asymmetry as well and you needed not microscope to see that those fern leaves were on average facing certain atsimuthal direction. One more thing. Outside these small hardened snow patches where the asymmetric halo showed, was ice with some frost growth on it. There a weak and symmetric 22 halo was seen. Hi, Jukka. I probably was not clear. What I envisioned was melting on the southeast side of each crystal. I did not mean to say that selective large patches of crystals were being wiped out. The latter mechanism, yes, would change the display if the observer wandered around, but the former would not. But, again, a look at the crystals ought to be decisive. OK Walt, now I see your point. Hmmm, who knows. Marko has this wonderful macro lenswith which I believe the magnification would be enough to see what is going on with the crystals. So Marko, next time you're heading out to the lake take the macro system with you. If I remember well, in all the observed cases of asymmetric surface displays, the halo showed up better on the right-side, which may support Walt's idea of the morning sun melting the southeast side of the crystals. However, I have no idea why these are observed on hard surfaces only.